Where Can You Easily Promote Your Music Online For FREE? Today I’m sharing how you can share how you can promote your music or business online for free. This is a well kept industry secret that can make the difference in your business and it is really very, very easy to do. This trade secret is for anyone in the industry – musicians, rappers, singers, music publishers, music promoters and in fact anyone with any kind of business. One of the quickest ways in which you can get your music out is to be sociable. One of the most amazing social media platforms is Facebook. Statistics show that Up to the second quarter of 2018, 2.2 billion people actively used Facebook each month. That is a huge number and you can find a tribe of people who are interested in what you have to offer if you know how to find them. In contrast, only 335 million used Twitter up to the second quarter of 2018. Those numbers show that Twitter should also be considered as an important social media platform for marketing one’s products. What is the strategy for FREE music promotion on Facebook? live video. The amazing thing is that Facebook actually helps you to promote your product free by helping you to find an audience. In order to use this wonderful platform, you only need to register for a free personal profile. I recommend that you also create a facebook fan page dedicated solely to your music business. -singing, playing music, teaching something etecera. You can talk about projects that you’re working on in order to keep your fans engaged and up to date. If you’re a songwriter, you can talk about what you’re writing and what’s inspiring you to write. You can also share inspirations about life, music lyrics – just be creative. There is no reason why you cannot hold a live concert and ask your viewers to contribute. There are resources that you can use to do that. I do not have any links right now and will update as soon as possible. Best of all, you can easily direct them to the websites where your products are sold. This can be done verbally and by the inclusion of a link in your status update. What equipment do you need in order to produce a Facebook live video? – A cell phone. I use a Samsung cell phone because it has an inbuilt Facebook live app with all kinds of great features designed to liven up my video. I also tag my audience to alert people who view that I am on. That also makes the video go viral since their friends can also see it. You can download quite a number of facebook live video apps from the Google Play store if you do not have inbuilt live video streaming. There are quite a lot of streaming software for facebook live video, but I personally find them aggravating since they take a while to setup and can be cumbersome. 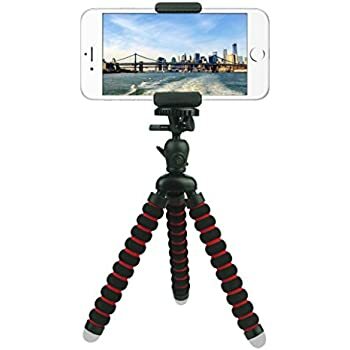 a tripod on amazon.com. They’re not all that expensive. I bought one for $1.99 and I was able to twist the legs in all kinds of directions. – You need good lighting to show your face and surroundings clearly. You can use a desk lamp or become really high tech and buy a light specifically for that purpose. A good light source can also be achieved by sitting in front of a window so there’s a lot of lights natural light streaming in. – Your surroundings can be in or outdoors. The locations should be quiet, attractive, uncluttered and appealing. You should also dress decently and maintain a friendly persona in order to keep the audience’s interest. One important thing is to be as interactive as possible when doing a facebook live video. You can “shout out” the audience and ask them to put their names in the comments box. You can also ask questions and ask for responses to be typed in. How long should you go live on Facebook? longer in order to keep the audience. I personally do hour long broadcasts because the topics I cover require that depth. I do get a lot of feedback off line and no one has complained about the duration. -A Facebook fan page is an important online store front which you can use to promote your music, download cards and promote affiliate products. Watch this video to see how to do so. It’s packed with over 10 lessons that will help you to get your home studio up and running.